“Enlightened Beings presents the life stories of the first six Gelugpa siddhas of the Ganden Oral Tradition, a highly specialized tantric system of meditation devised by the great teacher Tsongkhapa. The six siddhas were Tokden Jampel Gyatso, Baso Chökyi Gyeltsen, Drubchen Chökyi Dorje, Gyelwa Ensapa (pron. Wensapa), Kedrub Sanggye Yeshe, and the first Panchen Lama, Jetsün Losang Chökyi Gyeltsen. Each was a great tantric practitioner who accomplished enlightenment in his lifetime. 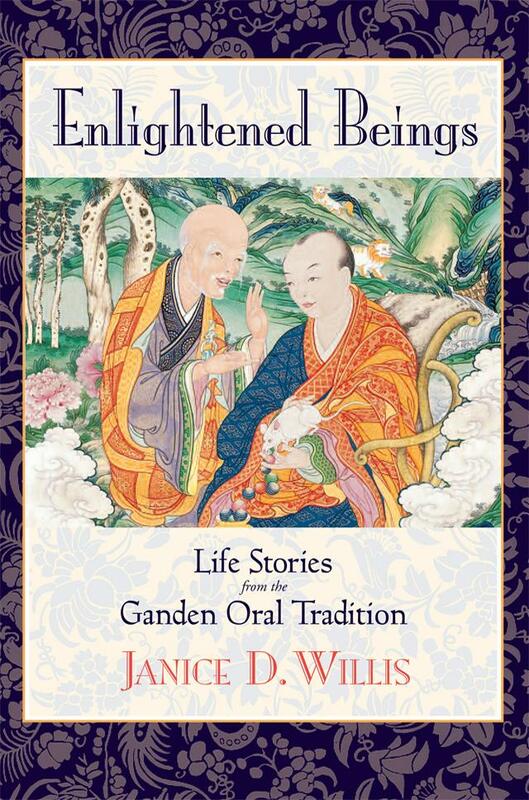 “Of all the stories I translated in Enlightened Beings, I especially like the one about Wensapa. Among the six, his is the lengthiest and, oddly, the most ’embellished’ of the stories, replete with miracles and fantastic elements. I say ‘oddly’ because—of all the six—Wensapa is actually noted for the great austerity of his practice, both on and off the cushion. In this sense, he reminds me very much of Lama Zopa Rinpoche.” What follows is an excerpt from that chapter. When the great Ensapa was seventeen years old, there was a widespread epidemic of smallpox, and he also contracted the disease. During his illness one day, while reciting verses regarding Dependent Origination near his door, he heard a voice. The moment he heard the sound of this voice, the hairs of his skin stood on end, and [immediately] he went outside. There he saw a monk with a white mustache and goatee, wearing religious robes of the finest cloth, whose bearing and purity were striking. Instantly realizing that this person must certainly be a great siddha, Ensapa invited him inside and there paid him the appropriate respect. Kedrub Sanggye Yeshe later eulogized the occasion of that first meeting between Ensapa and the great siddha Chö Dorje, calling it a “most auspicious confluence.” At the moment of their meeting, Ensapa knew in his heart that this siddha was definitely one who had attained the supreme fruition. Therefore, without hesitation he asked him to hold him dear thereafter. The great siddha Chö Dorje accepted this request with a joyful countenance and told him to come, at a specified time, to join him at [the hermitage called] Garmo Chö Dzong in the upper region of Tashi Dzong. Thereafter, as soon as Gyelwa Ensapa’s smallpox abated—it not being beyond the specified time—he proceeded, just as his siddha-guru had instructed him, to the hermitage of Garmo Chö Dzong. And after he had delighted the great siddha Chö Dorje with the three types of delight, that great siddha gladly gave him the complete and extensive instructions he had requested, starting with the Stages of the Path to Enlightenment up to the complete detailed practice instructions for the Oral Tradition of Tsongkapa. And the manner of communication between the two of them was like the pouring of water from one vessel into another. After this, Ensapa went to Pema Chan, one of the best places for attaining [siddhi]; and after practicing for a long time, he was able to remain completely absorbed within the circle of samadhi. It was then that the great siddha Chö Dorje entrusted to him the Miraculous Volume and gave him other secret precepts. Ensapa then felt that he must leave that retreat place so that he might practice in earnest in deserted foothills and in isolated ravines and hollows. Finally, having reached perfection in the complete instructions of the path of the sutras and tantras, he obtained increasing confidence in himself and in his ability to explain to others, who were fortunate enough to receive them, the precise and detailed practice instructions associated with the Oral Tradition. First however, in accordance with the directions of the great siddha Chö Dorje and the precepts given him formerly by Kyabchok Pelsang, Ensapa completely cast away the eight mundane concerns. Then, in numerous solitary places, thinking continuously of nothing but yogic practice, he performed the heart of the profound path. He smeared his body with ashes of dung, and, wearing no other adornments, he seated himself in the diamond posture and with great effort concentrated on his tutelary deity. He thought neither about how long it might take nor about the great effort that would be required, and finally he accomplished the ability to remain settled in samadhi at all times, day and night. On account of this, he was able to subdue whatever manifestations of the afflictive emotions, such as desire, might arise; and by degrees, even the tendency to count himself afraid or unable to follow the meritorious path was cast far away. He was able to settle his mind upon meritorious meditative objects of any nature, and all harmful habits relating to the places [and methods] of breathing were completely countered, so that whenever he applied his body-mind to any activity a unique bliss was born in him. [Describing this period of his life], he said that at that time, if he looked at a mountain, he could count even the most minute constituent particles of it, and that once it had happened that while he was living at Gepel, he had left his room at dawn and walked through the walls of many adjoining rooms without obstruction, and all there had been amazed. After that, at just over the age of twenty, because he practiced Guhyasamaja at the hermitage of Gyelwa Gyung in the Diamond Palace of Drakgya Wo, he attained unique insights of a marvelous nature such as being able to recite by heart and without the slightest hindrance all the traditions of the great scholars and siddhas of both India and Tibet as well as the exceptionally wise sayings of Lord Buddha himself. He also became well-versed in the many different kinds of languages of the Land of the Aryas [India] in both their colloquial and classical forms. He also said that at one time, as he journeyed to Shang, just after crossing the Gyelpo river in Takbü, he had joined and traveled along with some yogis and conversed with them using their Atsarya [Bengali] language. There were many traders present who, on hearing them, were amazed. Then, knowing this venerable one to be his chief [spiritual] son, the great siddha Chökyi Dorje gave over to him a [special] volume of the Oral Tradition as well as the Miraculous Volume. And by a great host of gods and lamas Ensapa was then empowered, becoming their Regent. In this way, the great siddha Chökyi Dorje gave to Gyelwa Ensapa the complete detailed instructions on the Oral Tradition of the sutras and tantras of the Jamgön Lama [Tsongkapa], and finally, after he delivered even the Miraculous Volume into Ensapa’s hands, Ensapa became the chief holder of the Oral Tradition teachings. Thereafter, at the most excellent hermitage of Pema Chan, also known as Pema Ö, the great Gyelwa Ensapa gave his first teachings of the Dharma to a congregation of religious persons gathered there. During this time also, wherever he traveled, he accomplished the virtuous activity of completely subduing all the evil spirits of those places. The great Gyelwa Ensapa then stayed for a while at Riwo Gepel. During that time, he occupied himself performing austerities and behaving in such a way as to cause [the experience of ] Bliss-Void to arise continuously in his consciousness. Then the wisdom Dakini advised him: “Tomorrow you will meet a pandita who is the reincarnation of the great siddha Peldre Dorje. To that one you should impart all the detailed practice instructions without reservation.” Ensapa went the next day to Tashilünpo and there met the All-knowing Lekpa Döndrub. Because of their mutual excellence in understanding the scriptures, they took to each other immediately, becoming close. Then, at the urging of the great All-knowing one, they jointly composed a branch commentary dealing with Bhairava and Guhyasamaja, and in order to extend even more their combined virtuous activity, Ensapa dictated to the All-knowing one The Treasury. At that time it was generally believed that this work had been composed by the All-knowing one [alone], but in reality it was done [primarily] by Ensapa. Nowadays, this is well-known, and it is listed [properly] in the Collected Works of Ensapa. Moreover, at that time, the great Gyelwa Ensapa was directed by the wisdom Dakini to entrust the whole of the Oral Tradition’s extraordinary practice instructions—which had been given by Lord Manjushri to Je Rinpoche—as well as some of the relevant portions from the Great Miraculous Volume to the All-knowing Lekpa Döndrub. Also a section of the Mirror of Secret Prophecy which nowadays forms a part of Ensapa’s Collected Works, was taught to the All-knowing Lekpa Döndrub. These teachings were the same ones that, in expanded versions, were later taught to Kedrub Sanggye Yeshe. Then on the eighth day of the winter month called Rawa, at the age of thirty-three, Ensapa journeyed once again to the great monastic university, the illustrious Drepung, birthplace of the famed heirarch Dromtön. And there, amidst innumerable faithful ones of the sangha, with the All-knowing Gendün Gyatso acting as abbot, and Hlawang Rinchen as master of discipline, and Drepung Yangdren Chenmo as confidant, he received the vows of ordination. And from that time forward, he discarded his former appearance and took on the deportment and activities that were in accordance with the Dharma and the Vinaya as prescribed [by the Buddha]. And for as long as he lived, he guarded those vows, never sullying even a single one with the dirt of evil speech or [bodily] moral downfall. Thereafter, he went to Lhasa and prayed in front of the Jo-Saka for the spread of the Dharma and for the happiness and welfare of all beings. Then, having taken out from a pillar the text called Kachem Kakölma, just as he was preparing to look at it, he declined, saying it was not necessary to do so. Later, in a dream one night, a yogi of dark purple color wearing a bear-skin undergarment and named Vinaya-holder Sakya Kalyanamitra, gave him a book called The Three Flowers of Manjushri, Which Clarify and then admonished him, saying, “When all your good deeds have been accomplished here, [only] then return to Tsang.” He then disappeared. On the following day, owing to all his exertions in preparation for going to visit Ganden, Radreng, and the other famed institutions nearby, he became violently ill in the middle of the road. Remembering his dream of the previous night and taking note of this occurrence, he decided that it would not yet be good to leave. And as soon as he began to return [to his lodging in Lhasa] his body became well again by itself. 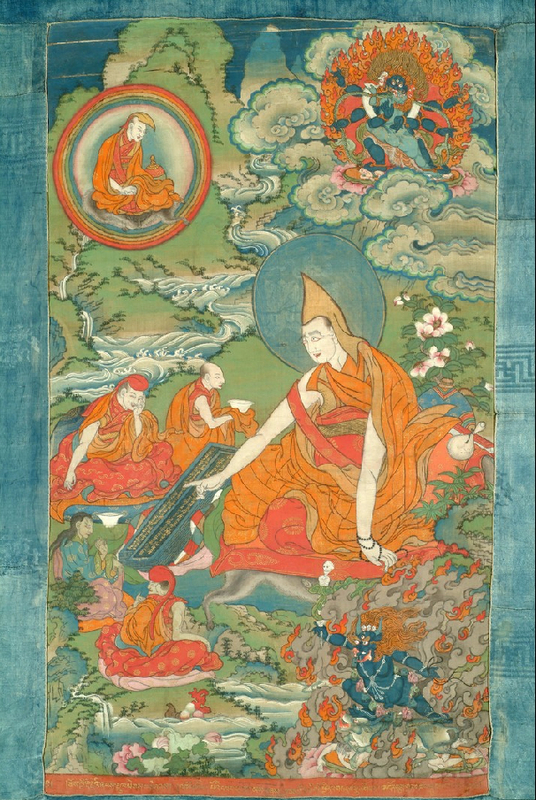 Thereafter, he went to Sera Tekchen Ling monastery and at the feet of the All-knowing Gendün Gyatso, he received an explanatory commentary on the Drubgyel Lukkyi Tse, a long-life empowering initiation, commentaries on the Sutra of Liberation, the Chödrak Sutra, and the Collected Works of the All-knowing one [Gendün Gyatso] himself, as well as numerous oral recitation blessings for assorted smaller texts. 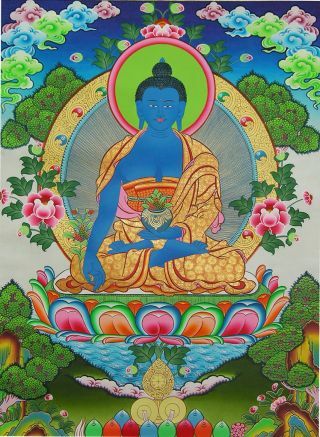 Medicine Buddha. Photo courtesy of FPMT Education Services. He then returned to Tsang. There again, from the abbot of Gepel, Lekpai Lodrö, he received an oral recitation blessing for the ritual ceremony of fasting, a practice permission for joining together certain mantras of his yidam, a permission for the practice of developing the knowledge of the inseparability of guru and protector, and an oral recitation blessing for the Medicine Buddha, Bhaisajyaguru. Next, from Panchen Jangchub Lodrö, he heard the root tantra of Sri Guhyasamsja and the branch commentary called The Clear Light. Then, from Ngari Lochen Namgyel he listened to the precepts of the Four Secrets and innumerable other profound teachings based on the Mother Tantras, such as the Four Positions of Cakrasamvara. 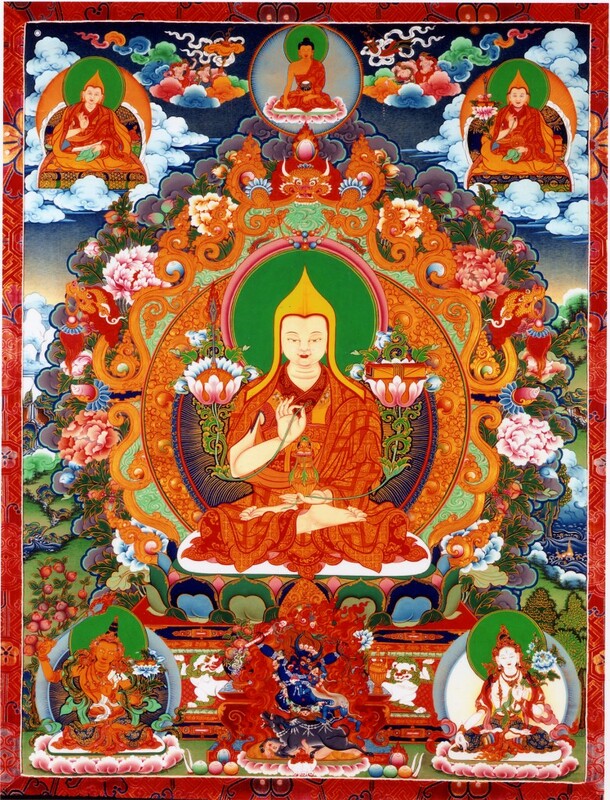 Thus, after considering his unique opportunity for studying the Dharma and taking advantage of it by listening to all the vast and profound precepts from a great many teachers, all of them [meditatively] accomplished and wise, he truly became a master of the entirety of the teachings of the scriptures. I alone am the holder. Now, to summarize, from the age of seventeen until the age of forty-two he not only studied widely but performed extensive retreats in numerous hermitages: the Diamond Palace at Drakkya; the Red Hermitage, where great beasts, tigers, and leopards roamed; at Kodrak; and in particular on the snowy mountain of Jomo Hlari at Panam. Thereafter, for the duration of his life, he sought out even lonelier retreat places far away from settlements, where people could not be heard or seen, and in those places he meditated unceasingly. Jan Willis is a professor emerita of religion at Wesleyan University. 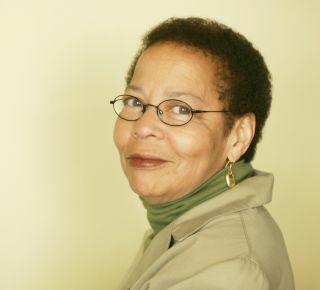 She has studied and taught Buddhism for more than four decades and is the author of several books, including Wisdom Publication’s Enlightened Beings, and Dreaming Me: Black, Baptist and Buddhist—One Woman’s Spiritual Journey. In 2009, Willis was endowed with the “Outstanding Woman in Buddhism” award.